Springer Origami Club | Origami instructions and links for Springer students….or anyone else interested in learning origami! OK, I know I promised a certain 3rd grade friend that I would post this a WHILE ago, but things got a little busy round here! Anyway, better late than never! This project is so much fun because you can play with it after you have made it, and you can be as creative as you like decorating the face, and even the inside of the mouth if you like! Have fun, and watch out for your fingers! Here is a video for how to assemble the hexahedron (sometimes called a Toshie’s jewel) made from sonobe units. I highly recommend sacrificing the first 3 units you make by clearly drawing on the mountain folds. This might seem a little tedious, but is very helpful when moulding the units into shape in your hands. Remember to pause the video if you need a little extra time, or rewind sections of it to see them again. This is not a live link, so you will need to copy and paste it in the browser window to go to it. You will need to print out the pages, and then cut them out so that they are all squares, and then assemble the cube just the same way we assembled it in class, but this time you will have to make sure that countries and continents match up! Whew! Just in the nick of time I remembered that I had promised a certain third grade class of mine that I would post the link to the origami(ish) dodecahedron that I gave their class today. I did not invent this ( I am nowhere near clever enough! ), but have enjoyed making them as gifts for people, and of course, it is always fun to teach other people how to do it, and pass it on…. The model was originally designed by Tomoko Fuse, and then was turned into a calendar by Sara Giarrusso and Ramin Razani. A dodecahedron is perfect for a calendar because it has 12 faces: one for each month of the year. I have made some video directions for how to assemble this model, and will work on putting them on here tonight. It takes a while, so if you are in third grade, please go to bed! You can see them tomorrow! And the final assembly one. If you are younger than 4th grade, or are a beginner in origami, please remember that this model is a little tricky. If you are having trouble, it is always helpful to have another pair of hands to help you. Good luck! Here is how to make the model that is on our header picture at the moment (at the top of this blog), called the Espiral, by the amazing Tomoko Fuse. I taught this to the 4-6th graders in the library, and it was a real torture for them to wait until the second week to learn how to put it together! Thanks to Mae for demonstrating the unit. You will need to make 4 of these to make the final model. This is the wreath we made in all the third grade classes as gifts for the room moms……if any of the room moms are reading this, then I hope you liked your presents! Due to limited time we didn’t really discuss how to assemble these units, so here is a recap for you to try at home. The first video is how to make the unit, the second video shows the assembly. Thanks to Anna for the lovely demonstrations! 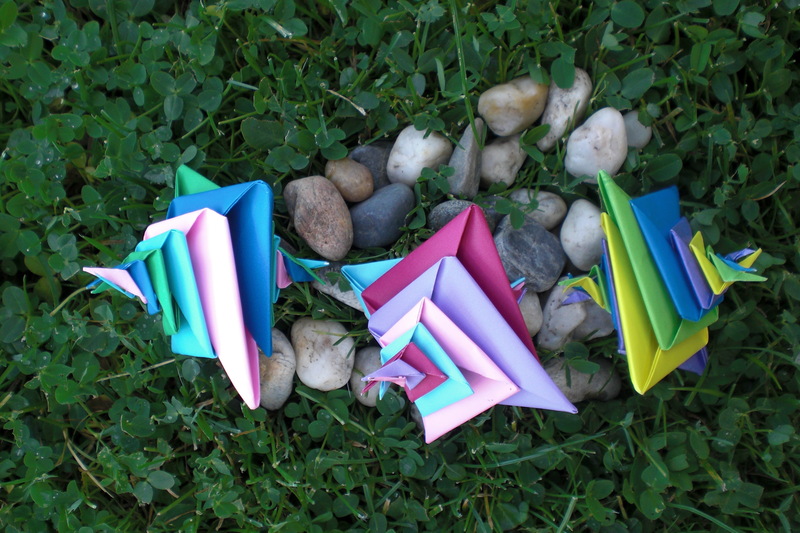 Springer Origami Club · Origami instructions and links for Springer students….or anyone else interested in learning origami!